If you think your commercial gas and electricity contracts are too expensive, the first thing you need to do is take a look at your latest business energy bills and check the type of tariff you’re on – if you’re on a rollover tariff or deemed rates, or your current fixed rate deal is due to end, it’s time to run a comparison and switch to a better deal. Business energy bills can be confusing though, so to help you get a better idea of what’s going on, this guide takes a look at all the information and individual costs that go into making up your bill. If you’ve already worked out what’s what on your bill, and you’re ready switch to a better deal, click the button below to instantly compare business energy prices online, or get in touch with our switching team on #CAMPAIGNBUSINESSSERVICENUMBER# - once you’ve found a deal that suits, we can take care of the switch for you. Unless something goes wrong with your supply, or you think you’ve been overcharged, your energy bill is the only communication you’ll have with your supplier, which means a lot of information needs to be crammed into it. At first glance, it can be difficult to distinguish which parts of the bill are relevant to you, meaning it’s all too easy to miss any overpayments you may be making for the energy your business is using. 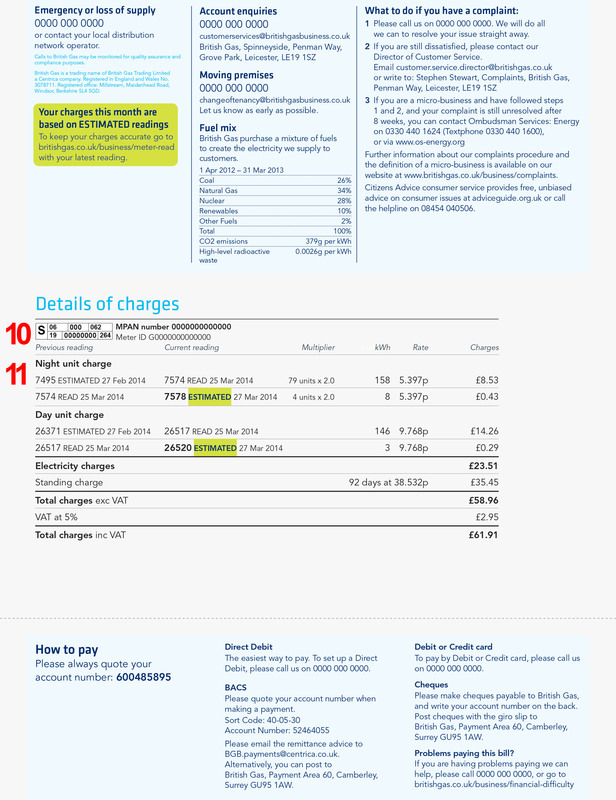 To help you understand your bill, here is an example of a British Gas business electricity bill, along with all the key information listed below. Your supplier may structure the bill differently, but all the information will be the same. What is the key information on your business energy bill? Bill date, bill number and VAT number - Bill date, bill number and VAT number - This is the date the bill was sent on, as well as the number of the bill. 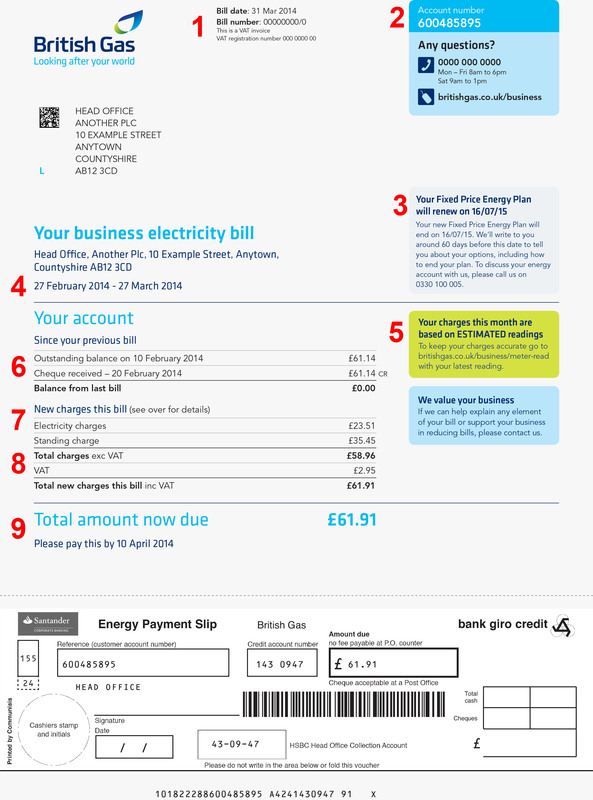 This information is often used by suppliers to quickly and easily identify your bill when making enquiries. The VAT number is the number that your supplier has on record for your business’s registered VAT number. If it is incorrect you should inform your supplier. Account number - This is a number used by your supplier to easily identify customer accounts. Contract details - This is a brief outline of your current contract details. Billing period - This the period of usage that you’re being charged for. Type of charges (accurate/estimated) - This indicates what type of reading your charges are based on. Accurate readings are based off a recent meter reading. Estimated readings, on the other hand, may not be representative of your current consumption habits, which is why it’s important to provide your supplier with regular meter readings. Outstanding charges from previous bills - This indicates if you owe any balance from your previous bills. Charges for the billing period - These are the charges that you have incurred during the latest billing period. VAT charges - This section shows how much VAT is added onto your bill. Remember, certain types of organisations may be entitled to a reduced rate of VAT, but this isn’t offered as standard. Total amount due - This is the sum total of your charges, including outstanding amounts from your previous bill, costs incurred from this month’s bill, as well as your VAT. MPAN/MPRN Number - This is the code used by your supplier to quickly and easily identify your meter and property. Break down of charges - This is a breakdown of charges, so you can see exactly what you’re being charged for in this billing period. You can also see what percentage of VAT you are being charged. Now you know your way around your bill, it’s worth taking a look at what costs contribute to final amount you’re charged, as working out some ways to reduce these costs. Suppliers buy energy in bulk before selling it on to customers, and the price your supplier pays for this energy for is known as the wholesale cost. This cost can be affected by a number of factors outside the energy market, such as natural disasters, political events and conflicts. Although this cost won’t actually show up on your bill, it is reflected in the unit cost you pay. This means that if wholesale energy prices rise, there's a good chance your business energy bills will too. How can you reduce it? – You can protect your business from price hikes by signing up to a fixed term business energy contract, which locks in the price that you pay per unit for the duration of the contract. Once the energy has been bought from the wholesale market, it needs to be transported to your business - and energy transportation isn’t cheap! Suppliers usually include this TNUoS charge with the overall price of your business energy bill, to cover any transport costs, as well as the cost of maintaining and upgrading the national grid where necessary. TNUoS is charged at a flat rate for most businesses, but it might be higher if your business is based in a more remote location, due to the additional challenges of providing energy through the grid. How can you reduce it? - TNUoS is a charge that is included within the total cost of all business energy bills. Short of taking the drastic step of relocating your business, there is little you can do to reduce this cost. The Distribution Use of System cost (DUoS) is applied by the Distribution Network Operator, which are regional bodies responsible for transporting energy directly to your premises. These charges will vary depending on the type of contract you have, your maximum supply capacity and the times that you consume energy. How can you reduce it? - This cost is affected by factors that make up your business energy contract, such as tariff type and your maximum supply capacity. If you’re looking to cut costs, you need to change your energy consumption habits. This will reduce the amount of energy that is being transported to your premises, and bring down the total cost. The Climate Change Levy was introduced by the government to make businesses more accountable for the energy they use and the impact this energy use has on the environment. This cost is charged per unit and is included into the overall cost of your business energy bill. How can you reduce it? – Because the CCL is charged on a per unit basis, the only way to directly reduce the amount you pay is to cut your business’s overall energy consumption. Please note: Businesses using energy from renewable sources are no longer exempt from the levy. To find out more, visit Ofgem. As with many products, VAT is charged at a rate of 20% on your business energy bill. This is typically added onto your bill and can be found in your bill breakdown - see the diagram above. How can you reduce it? – Unfortunately, there’s not much most businesses can do to reduce the amount of VAT they pay. But there are some exceptions - charities and other non-profit organisations are entitled to a reduction in VAT, but this must be applied for and is not offered automatically. It’s also worth noting that if your business consumes less than 33 kWh of electricity, or 145 kWh of gas per day, you can reduce your VAT costs to as little as 5%. There’s more than one way to pay your energy bill, you just have to work out which way is best for your business. Direct debit is efficient for busy business owners, as money is taken directly from your account to cover your bills, and some suppliers will even offer a small discount for customers who choose this method. But, it’s important to note that a fixed amount direct debit will not take into account any variance in your bills, for example during the winter months when you’re using more energy, so you could find yourself in debt with your supplier unless you keep on top of things. The advantages of BACS and online transfers is that it offers you the flexibility to pay exact amounts based on your energy usage. But if you don’t have the time to make the transfer every month, or if you forget to make the transfer, your account could easily fall into debt. Some suppliers can offer their customers the option to pay for their business energy bill by cheque. Obviously this method can afford you the flexibility to only pay for the energy that you have used, but doesn’t offer you the convenience and efficiency of other methods. And, when paying by cheque, you must allow time for it to be posted to your supplier (typically this will take 3-5 working days). Failure to post your payment in time can result in late fees. At the bottom of your business energy bill, you will likely find a pre-populated bank giro slip that you can fill out and take to your local post office. Ready to switch to a better deal on business gas and electricity? Call us today on #CAMPAIGNBUSINESSSERVICENUMBER# and start saving.